On a scorching hot day, Devon, a young Black child, skips out of the house and heads over to visit Mitch, “the metal man,” an artist and welder who creates art with scrap metal. Devon’s mother isn’t impressed with the metal man. She doesn’t think his work is work, or that his art is art. “It’s junk,” she says. But her words fail discourage Devon. When he asks the metal man if he can make something, too, Devon becomes afraid to express himself, thinking his ideas too dumb. But the metal man won’t have it. “Don’t be scared, boy. Bring it on out to play,” he says. And so Devon begrudgingly shares his ideas. Sparks fly — quite literally — as the metal man goes about sawing and torching and grinding the art his student had designed. When Devon shows his mother the “star-house” he and the metal man created, she is quite impressed, and changes her tune about the metal man and his art. This story really hit home for me because, as a child, I had my own metal man of sorts. Brother Larry Harris was an artist who offered drawing classes for children in the black community of Des Moines, Iowa. I only took a few of his classes — some 30 years ago — but he profoundly inspired me. Having been a heavy player in the Black Power movement of the 60s, he would mix messages of Black pride into his lessons of line, shape, value and composition. While drawing a face, he spoke about the beauty of African facial features — the broad nose, the thick lips. His drawings celebrated the unique look of the Black race. My favorite part of the class was when he taught us to draw an afro. He’d use squiggly lines and curlicues, telling us to “focus on feeling the hair,” as much as drawing it. He also introduced us to the word subjective, explaining how, with art, there is no right or wrong. 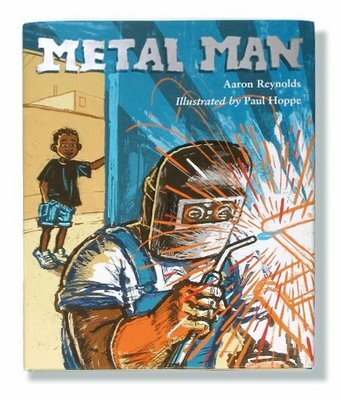 I thought about Brother Larry Harris while I read the book Metal Man because, like Devon’s mother, my dad wasn’t very excited about my artistic aspirations. I never expressed my ideas with him, are you kidding? And it will hit home with kids, too, at least it did with my six-year-old son. We read the story together. His favorite part was the sparks that jet off the page from the metal man’s torch. He surprised me with his observations about Devon’s language. Throughout the story, Devon uses words like ain’t, gonna and whadd’ya. Dialog includes phrases like Whatcha makin’. We couldn’t get through a couple paragraphs without my son interrupting the story to correct the author’s grammar. I commended my son on his good use of language, but also reminded him that everyone speaks a little differently. I explained that some people — like his dad —use words like ain’t and got and gonna, and that they appreciate seeing their imperfect language used the literature they read. It’s called voice, I told him. And it helps to define a character’s personality, background, culture. He didn’t seem understand (he was more interested in being right), so I decided to shelve that topic for another day. Although Metal Man is for children, it has a quiet message for adults, too: Spend a little time with a child, mentor them, inspire them. A few minutes can create memories to last a lifetime. The art is by Paul Hoppe, and it is very impressive. Paul uses bold brush strokes — digital? I think — to outline his work, and mixes soft earth tones with fiery oranges and reds to create the illusion of sparks shooting off the page. If you have a picture book that you’d like to submit for possible mention here, send me an email and I’ll return it with my mailing address. Picture books or very early chapter books, of particular interest to African American children (regardless of the race of the author). I’m looking for books with African American characters (however you choose to define that) or subject matter. Love the concept. Thanks for sharing this story, Don. I look forward to checking it out.